In case some of you haven't heard, it was announced yesterday that longtime poster Dusty/theBlackman has recently passed. He was self deprecating, humorous, gracious, talented, and just a really nice guy. He had some interesting stories and I'm glad to have known him. The world is less without him. Although he wasn't about much in later years I feel the loss in mine. I really loved his Mr. Feiht fiction. Dusty, don't black jack the angles...but nick a few purses eh...man's got to keep sharp. Dusty was good people. He had some great stories and you could tell he loved singing his songs. I think his friend summed him up as "a true friend and a real human being". That's a hell of a nice epitaph to leave behind. I was wondering how he was. Sad news and thanks for letting us know, dethtoll. Such sad, sad news. 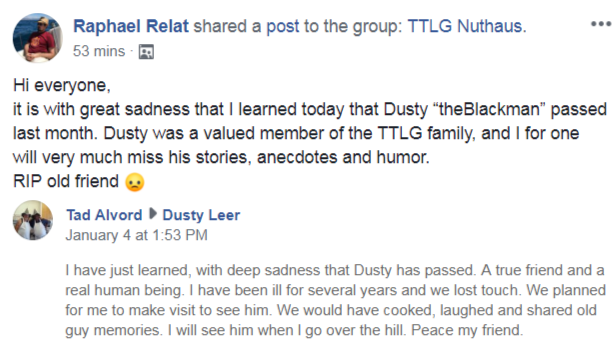 I know Dusty had been suffering from ill health for the past couple years. He is already missed. Rest in peace, old friend. so sad to hear Rusty has gone. So sad and sorry to hear of the passing of another iconic TTLGer. 2018 was incredibly sad for many reasons, with extremes going on here, idiotic trends skyrocketing and worst of all, related to here and only here, famous TTLG forumgoers and FM makers that died untimely deaths. I still miss Lady Rowena even today. The other thing is, at the very least theBlackman died a somewhat peaceful death, old age instead of younger than 65, he may have lived more but alas, Death decide so. Rest in peace Blackman, we had much in common not least two old guys playing games with young intelligent crazies. I hope he enjoyed those times as much as I. Even being relatively new to TTLG myself, I feel this. RIP old man, it sounds like you had a reasonably good life.